Tuesday, September 11, 2001 started out like any other day, but it quickly changed the American identity and became forever embedded in our history and our culture. We don’t need to really refresh you on the events that occurred 11 years ago today, but on the Two-for-Tuesday blogs we’re contributing, we can speculate on how social media might have impacted that day (had we had it), and also report on the New World Trade Center. Today, we remember the Twin Towers which used to dominate the downtown Manhattan skyline. Eleven years ago, they were brought down—today their foot beds remain as a memorial for those we lost, not just in New York, but in D.C. and flight 93 as well. As a testament to the American spirit, 100 yards away, a New World Trade Center is quite literally rising out of the ashes left by the twin towers. A year ago, on the 10th anniversary of the attacks, the city of New York unveiled the National September 11 Memorial and Museum—in which twin fountains constantly flow and display the names of those lives which were stolen that day. Now the tallest building in New York, and still climbing, the New World Trade personifies the journey America has been on for the past decade. We won’t erase the memory of the day, but we will not be defeated. We are steadily building a stronger, solid—concrete in fact—foundation rooted in our past, our history. The new Word Trade stands over New York City as a testament to our perseverance, reminder of our tribulations and guardian of our American spirit. After eleven years, 9/11 has made us become stronger, stand taller and demand respect and unity. Our country’s wounds may still be fresh, but we have found a way to find beauty in tragedy. Over the past 10 years, we’ve had to trade a lot. Trade our innocence for our consciousness; trade our security for our scrutiny. But from it, we have the opportunity to make a new world. Don’t ever forget the events of 9/11; instead, let it transform you as New York has let itself transform. I remember, like most Americans, where I was on September 11, 2001 when I heard the news. All the students in my grammar school were called into the cafeteria – footsteps were the only sounds that filled the hallways as all the faces of confusion began to walk down the stairs. Our principle came out and told us of the events that had just unfolded, the tragedy which we later learned, took nearly 3,000 lives that day. Eleven years later, I think about how technology could have changed 9/11. There were texts and phone messages left to family and friends that day. But what if Facebook and Twitter were open to the public then (they weren’t until 2006). Might other students and myself been glued to our phones checking social networks for instant updates while walking down to the cafeteria. Would it have been any easier to grasp what was going on? It’s overwhelming to think what a few of the first tweets or posts could have said or shown as the incidents were occurring. Instead of phone messages, there may have been a Tweet that read, “I’m okay.” Or “Waiting for firefighters.” Or “OMG WT* is happening!” Perhaps there would have been a photo sent from a phone of an interior office destroyed by the impact or a glimpse of what it looked like in those chaotic staircases. It’s hard to consider that people would have been thinking to take a picture during a life or death situation. But as we have seen through the tragic incidents of the earthquake in Japan and the theater shooting in Colorado this past year, the rise of social networks allow people to share, the good the bad and the ugly, more quickly than ever before. I wonder, would it have provided a bit more closure for families or friends to have a picture into what their loved ones were experiencing in those moments and hours? Perhaps. Would it have been better for others to not know what they had endured? Maybe. We can speculate all day long but the truth is, though it may have changed how we experienced the tragedy, social media would ultimately not have changed the intent or likely the outcome of September 11, 2001. We know for certain, social media has altered the face of American culture forever. 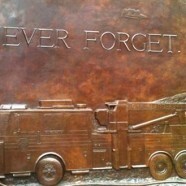 And without question, 9/11 changed America’s heart, eternally. Nicole Hernandez is the Social Media Manager at SJG. She’s a Chicagoan who graduated from DePaul University with a BA in Public Relations & Advertising and minor in Journalism. Nicole is known to her peers as being online all the time – while in her spare time you can find her taking footage on her phone as she’s rocking out at music festivals. She’s also training to be the new water girl at Chicago Bulls games (in her dreams).